Let’s face it, finding a job is a job! In this interactive workshop, students and alumni will learn how to effectively use job search tools ranging from time management to networking to online job boards and social media (including LinkedIn, Facebook, Myspace and Twitter). Whether you are technically savvy or technology leery, you will get great tips to improve your job search process! Wednesday, Sept. 22, 2010 from 5:30 to 7 p.m.
How I Got Fired On Facebook! Students and alumni are encouraged to attend this workshop on social media and networking. Attendees will be shown useful ways of navigating social media (including LinkedIn, Facebook, Myspace and Twitter) to broaden their professional network. Developed for all Peirce programs, this workshop will be facilitated by an Information Technology professional with social media expertise. 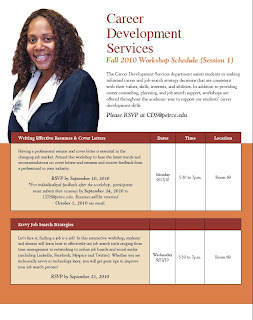 Wednesday, Oct. 13, 2010 from 5:30 to 7 p.m.
Come out to this workshop to receive interviewing tips from seasoned professionals in various industries. In this session, you will be provided information on how to sharpen your interviewing skills and you will also have an opportunity to practice! Join us for hands-on experience and honest feedback! Wednesday, Oct. 27, 2010 from 5:30 to 7 p.m.
And remember, if the workshop you need is not available or if you cannot attend one of the scheduled sessions, you can always contact CDS to make an appointment with a counselor for a one-on-one session!